Has the procedurally-generated game been done to death by this point? Keen Games doesn’t think so, and they hope that their latest release of Portal Knights shows that there are still plenty of ideas to apply to an area of gaming that is dominated by the likes of Minecraft. Let’s see if their RPG-centric ideas agree with the zaniness that can occur when your world is procedurally created. Keen Games used their own in-house game engine for Portal Knights, which is fairly rare to see from a more independent developer. The result is a game that runs at a fairly consistent and high frame rate, dipping only in action-heavy moments in split-screen (more on that in a bit). Water blocks also have the occasional odd block-ish look to them, which thankfully doesn’t last for very long. Overall, the graphical fidelity of Portal Knights falls somewhere between the Unity and Unreal engines, featuring all the different biomes you’d expect, from lush forests to harsh deserts, winter wonderlands, and the amusingly-named Brackenburg. These biomes are presented in a way unique to Portal Knights. The game has a story about the splitting of the world into multiple islands, separated by portals (hence the game’s name). So each island that you travel to is a randomly-generated version of a particular biome. While the exact layout of a given island may vary from game to game, the number of portals and which islands they link to do not change. You are also guaranteed to see certain resources on certain islands, thus giving the game some more consistency that is easy to keep track of. Islands also occasionally include time-limited events, which task you with completing certain objectives such as killing a minimum number of enemies in order to earn a reward. NPCs also frequent these islands, and offer quests for you to complete at any time. 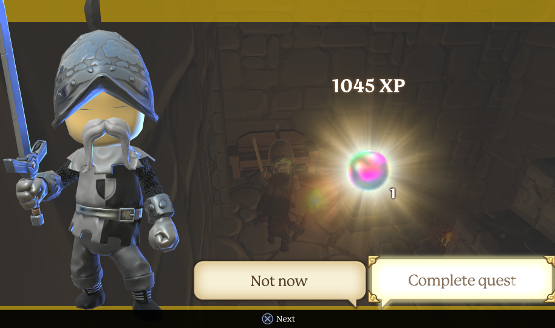 This shows some of the focus that Portal Knights has in always giving the player some concrete goal to achieve. Don’t let Portal Knights’ cheery visuals and easy-going soundtrack fool you; this game has some combat chops. Enemies often put up quite a fight, and the larger ones will require teamwork in order to defeat. There are even boss characters after passing through a certain number of islands, which each need to be approached in a certain way in order to kill. These boss characters also help to break up some of the same-ness of the regular levels, something you don’t really see in this type of game. 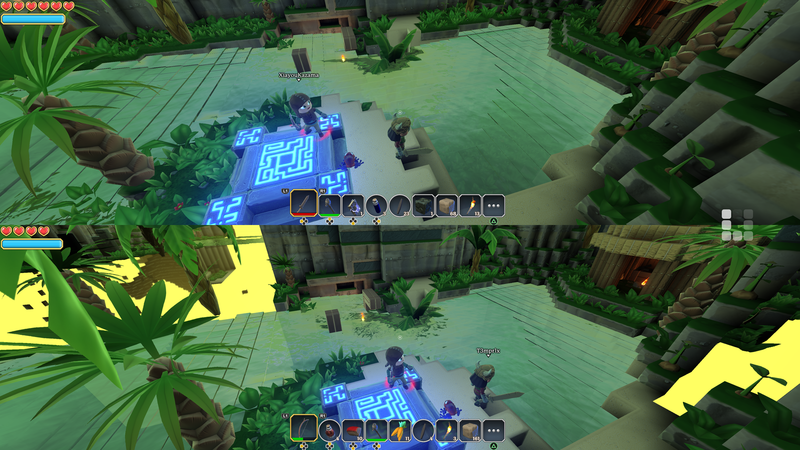 Portal Knights supports multiplayer, and some of the later enemies practically require it. This includes split-screen support: up to two players per console for a total of four players. For some reason, split-screen caused issues when playing on the same console as the host player, leading to game-stopping crashes out to the PlayStation 4 system menu and bug report screen. Once the host player was on his own and the other two players shared a guest PS4 system, the game stopped crashing entirely. Thankfully, Portal Knights doesn’t take itself too seriously. For starters, you can obtain a pet such as a rat, frog, owl, cat, or other creature, either by freeing one from a cage in a dungeon or by purchasing one from a merchant, but these pets do nothing other than follow you around, occasionally making noise. You’ll probably also die fairly often in this game, whether from taking on an enemy (or group of enemies) who was too powerful, or dodging your way right off an island into the abyss, it’s bound to happen to even the best of us. Yet the only penalty for falling in battle is a percentage of coins that you currently have, which are dropped by almost every enemy in the game. That’s right, you won’t lose your items, or experience, or anything other than some relatively easy to obtain currency. RPG elements are also added onto Portal Knights. You have three different classes to choose from – Warrior, Ranger, and Mage. Each have different weapons and armor that only they can use. In addition, leveling up unlocks special abilities unique to each class, such as regenerating health as a warrior, stealth attacks as a ranger, and other magical abilities for the mage. These abilities can be swapped at will, encouraging experimentation to find your perfect build. There are also specialized crafting stations that can be built, which produce each class’ exclusive items, such as an anvil for the warrior or an archer station geared towards the ranger. These are necessary items to build and upgrade to unlock more powerful weapons and armor to ensure your victory in the game’s late stages. Portal Knights presents some interesting ideas for procedural games. However, it lacks a sense of ownership that games like Minecraft offer. Once you’ve cleared available quests and found all portals for an island, there is little incentive to ever come back to that area, save for the odd resource. While tougher enemies come out at night, they generally stay in their spawn area, thus the necessity of crafting a home diminishes considerably. Furthermore, rather hefty loading times discourage frequent traveling, or make it a bit of a pain to have to backtrack. Islands aren’t particularly large, so the loading times can be perplexing. Any structures that you do create will end up looking impressive, however, because the game automatically generates interesting wall, window, and roof textures using a single block type. You can also carry up to 200 of the same blocks in one stack, though picking blocks up requires you to get abnormally close to them. If you’re in the mood for a more light-hearted take on the procedurally-generated survival genre, then you may want to check out Portal Knights. Its inclusion of major RPG elements gives you new unlocks to look forward to and experiment with, and its easy yet robust crafting system always tasks you with collecting something different. Combined with specialized and upgradeable crafting stations, Portal Knights feels like it has more focus than many games in the procedural genre. These varying gameplay mechanics all meld together to produce a game that is good fun to play with friends. Review code for Portal Knights provided by publisher. Reviewed on PS4 Pro. For more information on scoring, please read our Review Policy here.